Since Ben Smith left Politico to join the meme clearinghouse, he’s led the online conversation by constantly keeping his site in the top right corner of this matrix. To do so, he’s stacked it with hires from the likes of Rolling Stone and Gawker–then attacked web flotsam as a reporter, not an aggregator. “A lot of what works in social is the same as what works in journalism,” he says. 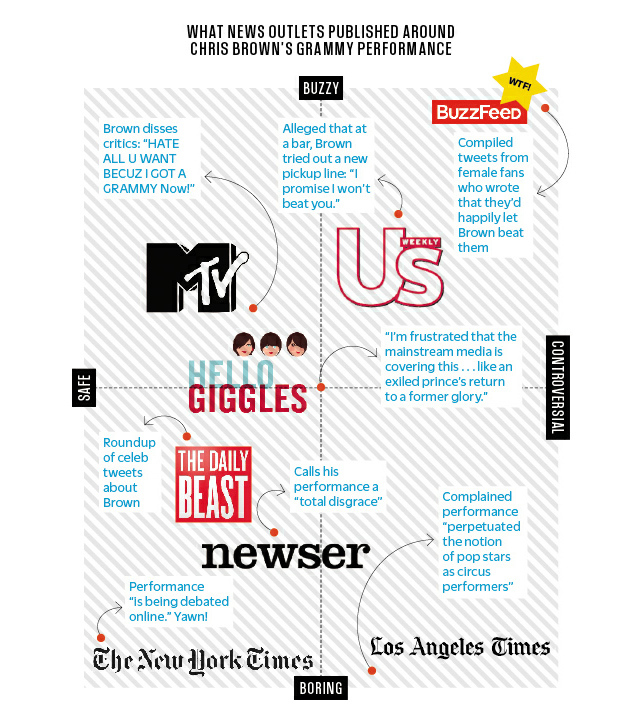 “People like it and share it because they think their friends will like it too.” Case in point: When Chris Brown won a Grammy two years after he was arrested for assaulting his then-girlfriend Rihanna, his coverage was the hottest on the web. “What we found was horrifying,” Smith says.